The world as I see it is a very different place today than it was just a few short weeks ago. The world today has to be divided into before and after, with September 11, 2001, as the dividing line. "Before," when the Twin Towers of the World Trade Center dominated the skyline of lower Manhattan. And "After," when everything -- everything -- was different. The losses we suffered are too much to think about. Nobody knows what the final numbers will be; clearly, they are in the thousands -- thousands hurt, thousands killed. Everyone in this area lost someone. A family member. A friend. A neighbor. A delightful young woman who will always be a friend of our family lost her uncle, who was the co-pilot of the plane that went into the Pentagon. And the firefighters. Dear God, the firefighters. This statement may say it all: "From 1865 until 2001, FDNY lost 774 members in the line of duty. On September 11th we have lost an additional 343 members." Father and son firefighters. Brothers. Cousins. The Chief. The chaplain. Twenty-one captains. Forty-six lieutenants. Too much really to comprehend. Too much to memorialize. Add to that the 47 members of the Port Authority Police Department. Forty-seven, all at once. Add to that the 23 police officers who were lost. Think about that: 413 uniformed officers and emergency medical personnel, gone, in the space of a few minutes. I can't begin to tell the human story. I can't even come to terms with it in my own mind. I keep trying to hold on to my eternal gratitude that my friend Peter, who works for the Port Authority, is okay, and that my cousin Rachael was on the other side of the Pentagon. But because of where I live and where I work, I can't get away from the physical story -- the Twin Towers -- MY Twin Towers -- are gone. No matter what kind of memorial is built, no matter what use is made of that space in the future, nothing like them will ever be built again. And that part, maybe, I am ready to talk about. 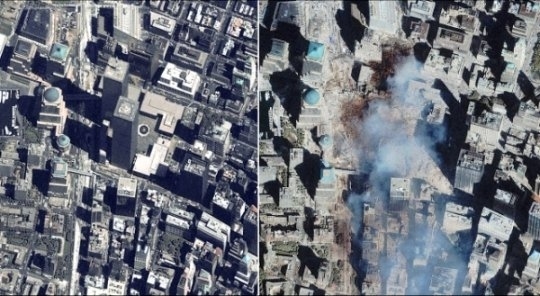 To begin to deal with the reality of the Before and After September 11th.